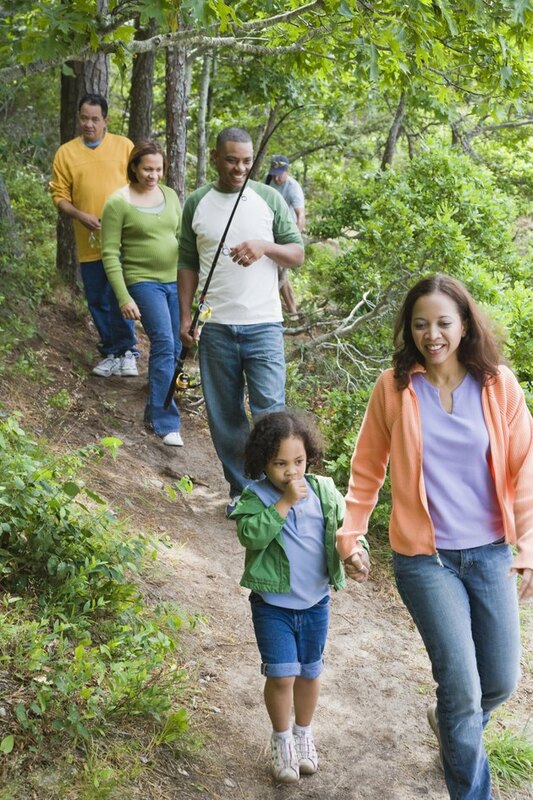 Whether you’re walking hills for fitness or enjoying a hike in the great outdoors, reaching a downhill stretch of terrain feels like a welcome relief. Although you perceive that walking downhill is easy, it actually places high demands on your muscles, can build muscle if performed on a regular basis and can cause injury if you do too much without building up gradually. Walking utilizes numerous muscles throughout the body, including your hip rotators, calf muscles, abdominal muscles and hip flexors. You use your quadriceps to extend your knees and flex -- or bend -- your hips. You also use your hamstrings to extend your hips. Downhill walking places demands particularly on these knee and hip extensors. Muscles can contract in two different ways. Perhaps the most well-known type of muscular contraction is the concentric contraction, in which a muscle shortens. Downhill walking, however, utilizes the other type of contraction: the eccentric, or lengthening, contraction. As you walk downhill, your body gains momentum. To counteract this momentum, your knee and hip extensors must contract eccentrically to slow down your stride and reduce the impact on your weight-bearing leg. These eccentric contractions build strength throughout these muscles’ ranges of motion. While it may seem easy-going as you walk downhill, you actually use three times more energy than you do as you walk uphill. The energy demands go to the braking action of the eccentric contractions. Without these eccentric contractions, you would gain too much speed and break out into a run. Even though downhill walking effectively builds strength in the hip and knee extensors, it carries some dangers. Muscle soreness is typically greater with eccentric, as opposed to concentric, contractions. This pain generally arises after you’ve finished walking, so you might not realize you’ve overdone it until it’s too late. Downhill walking also places significant stress on your ankle, knee and hip joints. If you have problems in these areas, downhill walking may be contraindicated.